As we know, pain is vital and a necessary mean of survival, and even when sometimes it's truly annoying and undesirable, this keeps us from hurting ourselves in worst and lethal ways, but how much this feature could be useful for prosthetics users? Prosthetics have evolved considerably throughout the years with the advances of technology and science, and nowadays, thanks to biohacking and robotics we're witnessing the rising of the medicine's future. Feeling physical pain is a feature maybe it's considered as a "luxury" that prosthetic users don't have and also seems like a contradiction since the primary aim of a prosthesis is to make amputees' life more comfortable and not the opposite. Researchers are reported to develop a prosthesis that can feel sharp pain so that this automatically drop pointed and dangerous objects and also transfers that information to the wearer who feels it in the form of pain. 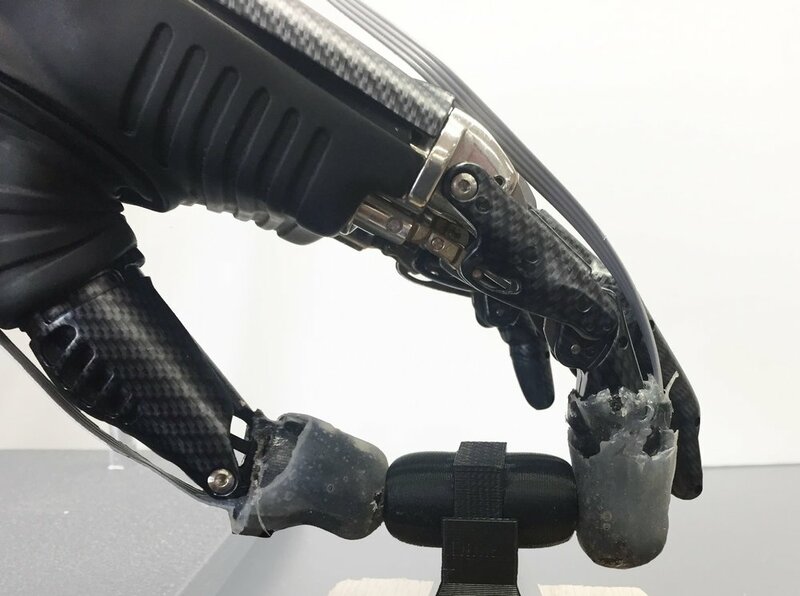 This innovative advance evidently will lead to the creation of bionic members able to feel and react more accurately and realistically according to the user's sensations, which could mean for them a way to take better care of their prosthesis. When one gives a blunt object to pinch to the prosthesis, a lot of sensors are activated across the fingertips. “That gives you an indication that the object is what you'd call innocuous, or it wouldn't be painful if you picked it up,” says Johns Hopkins, a biomedical engineer. The prosthesis can know if something is wrong by sensing the distribution of pressure which makes them automatically drops the pointy object. The user receives information thanks to a model that turns pressure information from the sensors into electrical signals employing a series of electrodes that stimulate nerves in the user's upper arm which is where the prosthetic is attached. So picture this, amputees don’t just have to deal with the pain of the injury itself, but the pain of wearing a device that can be uncomfortable. “So this is an interesting thought. It really sort of forced me to think about what actually leads to the richness of the sensation that you feel every day. It's just like spicy food: It hurts, but it's good.” Yes, that sounds like some Black Mirror's episode. Nevertheless, Osborn's study was submitted to proper review before it started. “We set up these experiments very carefully and wrote up the protocol to get reviewed by the institutional review boards, so we make it very clear that we're not going to do anything that's going to damage the volunteer,” he says. Accordingly, volunteers could stop at any time they decide to, a definite limit was established on how much stimulation they could receive. This brings us to the second problem: Pain is a notoriously subjective experience since we don't experience it in the same way. Thus, this particular “feeling” prosthetic takes and turns into ones and zeroes, will be experienced distinctly by the person attached to those mechanical fingers if they're hooked up to a system like Osborn's. Let's remember pain scale is also variable from one person to another, so developers of commercial prosthetics limbs that could feel pain have to be careful tailoring it to the wearer’s tolerance. The more important thing here's the wearer would want to feel pain in the first place. “I get the idea of having some type of notification via prosthesis that you're damaging the device,” says Angel Giuffria, aka the bionic actress, who has studied stigma against amputees at Southeastern Louisiana University. “Does it necessarily need to hurt? No.” She adds, though, that because the researchers reproduced pain non-invasively and on a commercial device, this could lead to more natural sensations in prosthetics. Indeed, there must be other ways to transfer that information to the user if this is accidentally damaging their prosthesis: a LED light, or some additional stimulus. But part of the benefit of pain is its immediacy: The sensation of a hot pot handle is so shocking that you have no choice but to reel away. Maybe pain has to feel bad to work. But we’re getting ahead of ourselves. Robotic prosthesis have come a long way—Giuffria can put on her bionic arm and shake your hand. But she can’t feel herself shaking your hand. So, just like be as futuristic as in The Hand of Madness, it will take a while longer for bionic limbs to provide users with robust feedback, let alone pain. And those sensations will need to be tailored to individuals' needs. This is just the beginning for researchers in the adventure of how to make machines feel. The quest is as much about replicating the senses as it is about ignoring certain stimuli. Will the bionic limbs of tomorrow feel pain? Definitely, it seems that yes and that Mads Madsen will have his bionic hand in the future after all. This is News from the future by Madness Serial. Subscribe to receive the latest and relevant news about science, technology and world politics direct in your email. Privacy is important, so we’re not going to share your email or information with anyone.